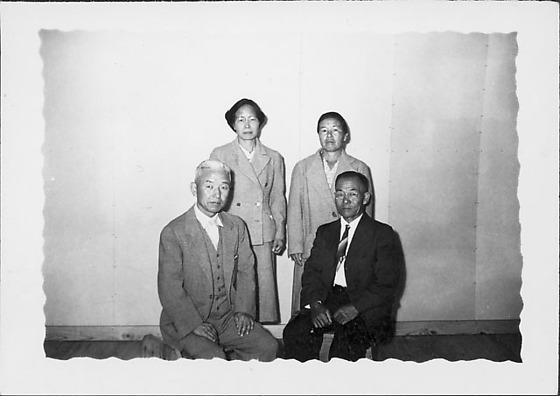 Group portrait of two couples in front of a wall in Rohwer concentration camp, Rohwer, Arkansas, 1942-1945. Two men sit on wooden chairs or stools; man on L wears a three-piece suit and has white or graying hair; man on right wears dark suit, necktie, and eyeglasses. Two women stand behind men dressed in similar gray jackets; woman on L wears eyeglasses. Featureless paneled interior wall with a strip of unfinished wood wainscoting in background. Image has irregular scalloped border.